This is a photo from Christmas 2003. B and a friend of hers named Linseed Donald Clarkbar were helping to decorate our house and decided to place this styrofoam Santa Claus in the corner of a ledge above a stairway landing. Apparently one of our three pets -- a cat and two fish, so I'm betting on the cat -- decided to reposition it for the humans' amusement. 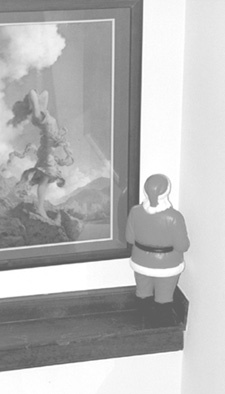 And as you can see -- and this is purely serendipitous -- the girl in Annette's Maxfield Parrish print appears to be deeply distraught by Santy's indiscreet behavior.